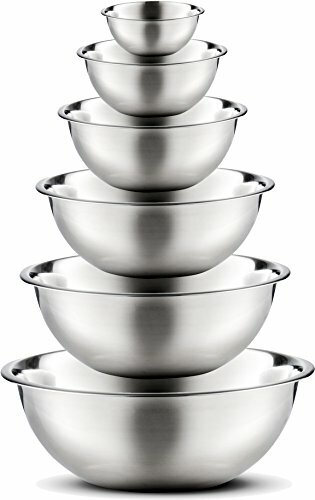 Stainless steel bowls with commercial grade metal that can be used as both baking mixing bowls and serving bowls. These metal bowls won't stain or absorb odors and resist rust for years of durability. This incredible stainless steel mixing bowl set is refrigerator, freezer, and dishwasher safe for quick and easy meal prep and clean up. They'd also make a great gift for Christmas, holidays, housewarmings, and other special occasions!